There are numerous media players available for PCs, but none of them will work directly with an iTunes library. Given the popularity of the iPod and the huge appeal of Apple touch products like the iPad, iTunes is on a serious roll but it isn't hi-fi . 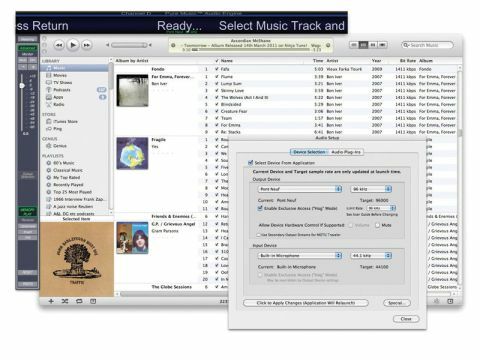 Pure Music calls it software, a high-resolution music server for Apple Macs, which makes it something of a rare breed. When we visited CES in Las Vegas, the majority of companies using Macs as their main source were using Pure Music as a player and controlling it with an iPad, so it was extremely rare to find a room without a Mac in it. Pure Music appeals for a number of reasons: it retains the iTunes interface, which is an easy system for accessing music and making playlists; it automatically changes the sample rate to match the source material – something that you ordinarily have to go into Audio MIDI set up to do every time you play a hi-res file – and it can upsample to suit the DAC it's streaming to. It will do this either in multiples of two, so that 44.1 becomes 88.2 or higher, or push sample rates up to the highest that the DAC can accept (384kHz). It's also very easy to switch upsampling for A/B comparisons. The resulting stream can be sent via USB, optical digital or a dedicated soundcard. The user guide gives you comprehensive instructions on how to get the best sound quality from a Mac, often involving minimising CPU usage during playback and the Pure has a memory play mode which furthers the same cause. As well as the iTunes native formats, like WAV, AIFF and Apple Lossless, it can also play FLAC files which iTunes does not support. Finally, for the benefit of your iPad/ iPhone/Touch, Pure can be driven with the Apple Remote app. In market terms, Pure Music is almost in a field of its own and while there are numerous players available for the Mac they don't work with iTunes nor offer playback of hi-res files. Sonic Studio's Amarra ($695) is its only real competitor on the Mac platform, but is currently limited to a maximum 192kHz sample rate. We used Pure Audio on an iMac and a Macbook (both running OS 10.6), with the Resolution Audio Cantata Music Centre using Ethernet and USB connections. Comparing Pure with iTunes alone made the latter sound soft and woolly. Pure increases focus, integrity of sound and image solidity. There is significantly greater definition and this improves timing as well as detail resolution, so bass lines are much more on the ball and transparency of better recordings is clearly enhanced. This is further improved with the Less is More controller mode, which minimises practicality, but delivers an increase in solidity of sound (it means you can't use the Remote interface) for dedicated listening. Upsampling by a multiple of two (44.1 to 88.2) also helps in detail terms and seems to make the music hang together more cohesively. We also compared a Macbook's optical digital output to the Cantata with the optical output of a CD player into the same DAC. The original disc has the upper hand over a WAV rip in terms of focus and attack but the difference isn't huge, using a coaxial connection from the CDP widens the gap. Pure Music clearly offers a lot for the iTunes/Mac user searching for better sound and the free 15-day trial makes it something that every Mac and DAC enthusiast should consider. This combined with excellent support from Channel D makes it more than worth the asking price.